Welcome to Palmetto Hall Plantation’s 18-hole Robert Cupp Course, an awesome one-of-a-kind creation that is unique in all the world of golf. Strikingly geometric in design, this distinctive par-72 course offers golfers a unique angle on the game. The layout features such unusual details as square greens, angular bunkers and pyramid-shaped mounding (look for “pyramids” over 10 feet high on the sixth hole!). The Cupp Course at Palmetto Hall is totally different from any other golf course on the Island – or in fact, the nation. 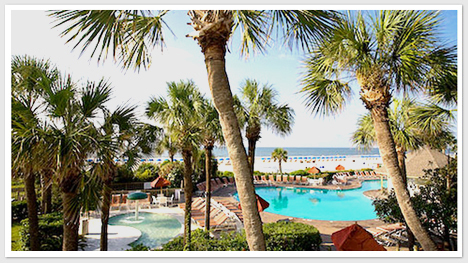 This resort hotel is located oceanfront on the south end of the island at Coligny Beach. Hotel features 202 contemporary-styled rooms only a short walk to the white sand beaches or to shopping, restaurants, golf courses and local area attractions. With more than 4,800 square feet of flexible meeting and banquet space, the hotel can accommodate groups up to 350 people. A professional sales and catering staff are at your service to assist in planning all your needs to ensure a successful gathering. From customized menus to specialized theme breaks, the staff will go the extra mile to make your event a success!